Owner Marty Mathis Bleeds Glenn Plaid. 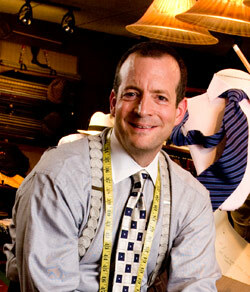 A passionate clothier, Marty launched Marty Mathis Direct in 1994 without an office or a showroom. True style knows no bounds, so he did fittings on location in business offices, airports and bathrooms. In 2002, he opened his Marty Mathis Clothiers showroom in downtown Minneapolis and has been pairing men with their signature styles ever since. All the pieces Marty Mathis creates are made-to-measure and a return to the new American classic. Everything is custom cut to fit your body type. Every fabric is selected for your lifestyle. Every color or pattern is aligned to your personality. Of course, no Marty Mathis wardrobe is complete without the highest quality belts, shoes, ties and accessories. Seven Minutes. Fun With the Guys. A Wardrobe That Makes Sense. Marty Mathis Clothiers is about getting you into the clothes that match your life and having a little fun along the way. Marty can take your measurements in 7 minutes flat without breaking conversation, and without you breaking a sweat. Before you know it you’ve invested in a suit that will look great for years. And you’ll be sitting at the bar in the back of the shop throwing back a beer to celebrate. We’re about creating and showcasing your true guy’s guy style. High quality craftsmanship, authentic fabrics and old fashioned customer service are par for the course when you walk past our hotter than hot window displays and into the Marty Mathis showroom. Marty and the boys are waiting to meet you.